Do you know what's rude about the Singapore airport? They have the normal security check, fine and dandy; then you get into the terminal and spend the rest of your Singapore dollars on yogurt and water and delicious snacks for the plane. And then there's another security check right before you get on the plane at the gate! They were gonna force me to throw away all my goodies (even though I protested that I had literally purchased everything 20 feet away, in the terminal), so as a sign of defiance, I hoovered my yogurt and bottle of water right there. And then really had to pee the entire time on the flight. Win. A great part about the flight to Sri Lanka - it was my first time ever flying Sri Lankan airways. They have this theme song that goes something like "Blue waters, shining bright; Sriiiiii Lanka, paradiiiiise." And the song repeats over and over and over as you're boarding and before takeoff, all while your TV screens play photos of Sri Lanka. And you can't change the channel. They're really into the self-promotion thing, which I appreciate (and now the song is in my head) so clearly it works, but I'm on your airline because I'm already going to Sri Lanka, silly! No need to keep (literally) singing your own praises. So before arriving, I literally had zero idea what I was getting myself into. 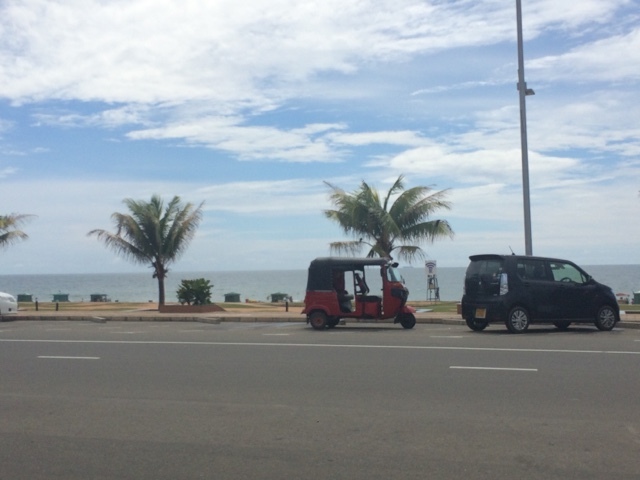 I'd heard Sri Lanka was an incredible place - like an easier-to-travel-as-a-solo-girl version of India (though obviously with its own flair and must-sees) - and that the entire country is gorgeous and nature-y. And that is how it got added to my list (that, and direct flights from Singapore). But I showed up with no itinerary, no hotels (due to lack of itinerary), and a vague idea of how safe it was for me to be traveling here alone (and by that, I mean I'd found the blog of a girl who'd traveled here solo and she seemed fine and alive to me). And I love it here already. 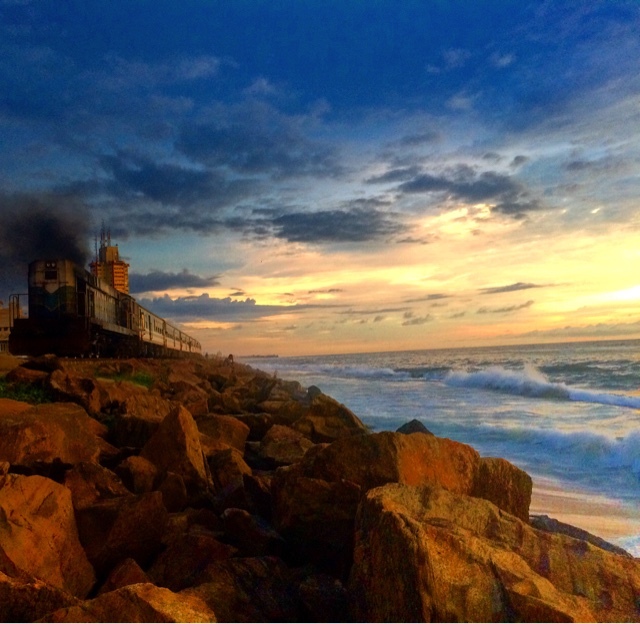 Sri Lanka is that adorable little teardrop-shaped island country off the coast of India. Because the entire country is surrounded by coastline, there are tons of gorgeous beaches and coast everywhere you look. There's dashes of colonial British/Dutch/Portuguese influence everywhere, given all those countries have occupied it, but also so many gorgeous nature and culture-filled places to visit. Not to mention the people are incredibly nice. Colombo is Sri Lanka's largest and main city. 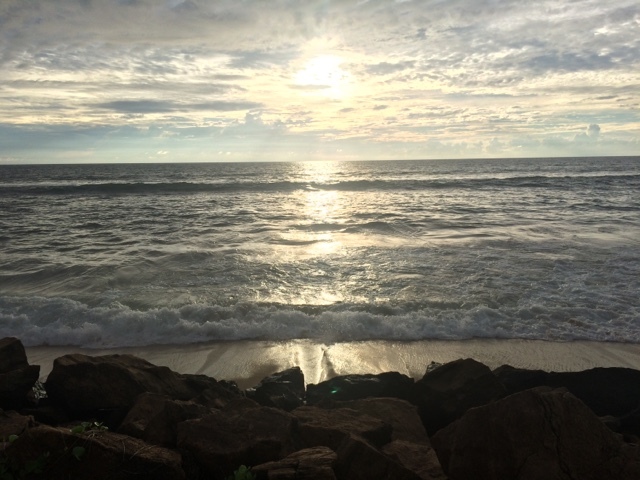 It's on the west coast of Sri Lanka and I really know nothing more except it's awesome and vibrant and bustling and has huge swaths of such pretty coast. Also, did you know the sunsets are especially vibrant/gorgeous on the Indian Ocean? It's true, because my guidebook says it. Honestly, I didn't do any major activities the first day - but the entire day was a set of small, incredible, random adventures. First off, upon arrival at customs - the customs official was the typical gruff employee. He asked me the usual questions, and then asked if I was here for work or on vacation. When I answered "vacation," he reached into a drawer and handed me an envelope. "Welcome to Sri Lanka!" 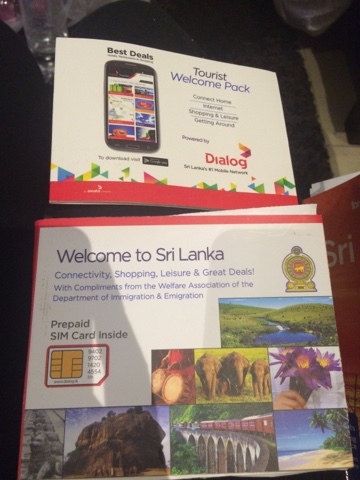 he said - and then hands me a "tourist welcome pack" with a free 30-day SIM card and a map, etc. He then opened the pack and unfurled the map and promptly spent the next five minutes suggesting places to go, asking me my interests, and happily circling places he thought I'd like. This was the customs officer. There were people waiting behind me in the official queue, passports in hand. It was the cutest. I died. Next, I got out to the arrivals hall, where a man at a counter promptly went ahead and attempted to set up my new SIM card for me (which didn't work because apparently my iPhone is locked, boooooo you AT&T). There were a ton of taxi/tuk-tuks waiting, but I'd heard that a cab to the city would cost around $30, while the local bus was $1. I wandered outside to search for the bus, and got guided onto a random giant red bus that was definitely not the one I was looking for, but everyone on board (which were all men, by the way - I briefly worried that maybe only men rode the bus in Sri Lanka) assured me it would get me within walking distance to my destination. Then I met two 18-year old guys from the U.S. on my bus and we chatted about our travels the entire ride over. Random and lovely. Checking into my dorm room, two older Indian men were already chilling inside the room - as we made our introductions, I mentioned my backpack strap was threatening to tear and had to find someone to fix it ASAP. One of the men told me I should go to the CD/DVD store (how is this place still in existence?) located under the hotel on the first floor. When I asked how the DVD store was going to fix my backpack, the man goes "They have a tailor in the back of the store." Um. Ok. So off I went. AND THEY DID. This DVD store (that also seemed to sell other incredibly random items, such as shampoo and instant noodles) had a tiny room attached, which had a tailor! The man was a magician. He took apart my backpack seams near the tear, did some other kind of crazy magic, and within 5 minutes, my entire backpack strap had been re-stitched and was good as new. Total cost? $1.50. Does the man realize I would have paid him 10x that amount?? I did tip him heavily while thanking him profusely for saving my entire backpacking career (because you can't backpack without a backpack!). 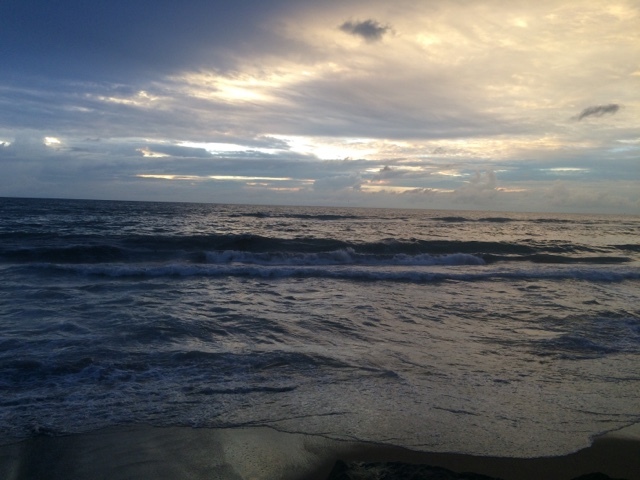 Given my guidebook had sung the praises of a Sri Lankan sunset, I debated going to some of the more popular areas in Colombo to watch the sunset. 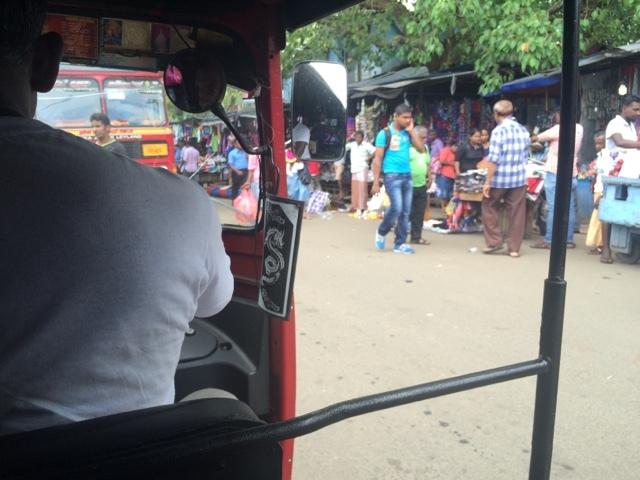 Colombo faces West, which means the sun sets over the water and is usually gorgeous - and in some popular sunset-watching areas, they have crowds of people and vendors and a fun, communal atmosphere. However, I ended up just walking a block away from the hotel to the coast - and it was one of the most magical moments of my life. It was like a movie. Along the coast are huge rocks that you can perch on, the waves are crashing, you can feel the sea mist on your face, and there's ocean as far as the eye can see. 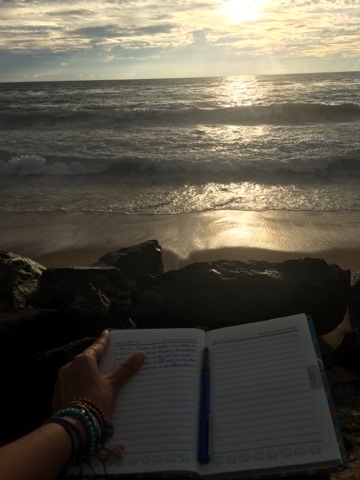 Also, I was the only person in the area - I felt like I had the entire ocean and sunset to myself. 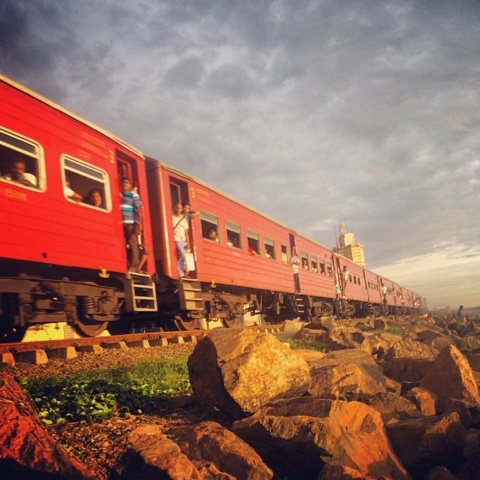 Railroad tracks run right along the coast as well (I had to walk over them to get to the rocks), and every 15 minutes or so, a train crammed to the brim with people (there are people hanging out of every doorway and window) would pass by and people would wave to me or shout. 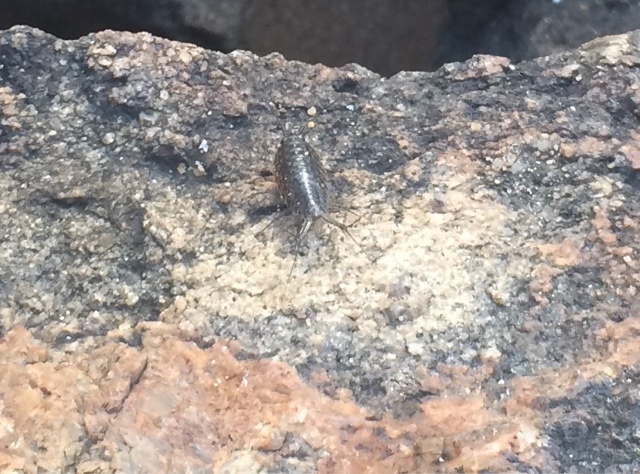 And all along the rocks are these tiny, tiny cute shrimp friends scooting around. I felt momentarily bad for loving to eat shrimp. It was a little cloudy so the sunset wasn't that visible. But I could have lived in this moment forever. So far, I am beyond loving the total change in feel and culture - everything is so new and exciting and interesting, and I feel like random amazing surprises are around every corner. By the end of the first night, I was already wishing I had longer than a week to see this country. I am just so, so delighted to be here. Buses are a major mode of transportation here - and a bunch are repainted former Canadian school buses. And they do that crazy thing where you have to wave them down from the road, and they stop randomly and wherever. It's a trip. I think I have a love affair with public transportation in other countries. Sorry not sorry that I just dedicated all my fun facts of the day to transportation.